Thames Rockets invite you to experience a Thames cruise 21st century style. The original speedboat sightseeing Thames cruise in London that certainly started it all. This is now our most popular speedboat experience. 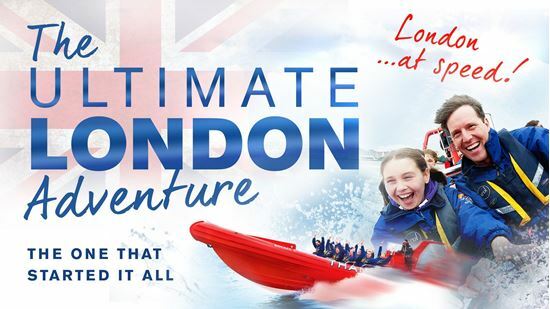 For anyone and everyone who wants to see the capital’s most famous sights with all the added thrills and spills of racing on our renowned Thames Rockets. Blast your way from the iconic London Eye Pier for 50 minutes that will stay with you forever. Take in the incredible sights from Big Ben to Tower Bridge. All this is courtesy of our award winning guides handpicked from the stand-up and acting circuit. Also closet history buffs by nature, their sole purpose is to provide a history lesson like no other. Think you know London? Think again! Once under the Tower Bridge, it’s time to tighten your grip on the Ultimate London Adventure Thames cruise. Hear the 630 horsepower engines rev up Rocket style and whoop as you whoosh up to speeds of 30 knots (35mph!). We’ll twist and turn you through the docklands with a bespoke medley of thrilling classics pumping through our cutting edge on board sound system. Everyone from Grandma to Grandkids are certainly going to be singing along with delight as you experience the #1 tour in London. We've taken out thousands of satisfied guests on our classic Ultimate London Adventure. Now is the time to experience this truly unique adventure. Combining the funniest guides and most experienced skippers. Thames Rockets have held the #1 spot in our category on TripAdvisor for 7 years – and we have no intention of that ever changing! Above all your safety is always our priority with your enjoyment a very close second. We guarantee that our Thames cruises will change the way you see the capital forever! *The Ultimate London Adventure departs from the London Eye Pier. This is the best moment for our 3 children (9, 13 & 15 years) during the visit of London. This is a good way to see some monument of London & to have fun. Speed, emotions & smile guaranteed! Really enjoyable trip. My 10 yr old son loved it, as did both the adults especially the fast bit. Guide was good. Wow hold onto your seat!!!! Amazing experience, what else could you wish for ? Fantastic views of the city,factual information,and a James Bond like ride.a definite must even if you have lived in the city all your life like we have.